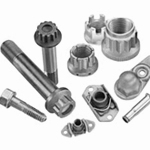 Jaco Aerospace offers a wide array of aerospace, industrial, and aircraft fasteners for purchase. All fasteners come with Certificates of Conformance and full traceability upon request: We’re fully committed to providing high-quality airplane fasteners that are held to strict Federal Aviation Administration (FAA) standards. We are considered experts in this field and carry many classifications in stock, such as MS, BAC, NAS, and AN, to aid consumers in obtaining the right aerospace fasteners for their aircraft. If you need help in identifying or ordering the appropriate products for your airplane, don’t hesitate to contact us: We are here to assist with all of your fastener needs. Order from Jaco Aerospace and choose from our extensive selection of aircraft fasteners in a variety of types from the world’s leading manufacturers. We offer a huge stock of aircraft maintenance supplies, so no matter what type of aerospace or industrial fasteners you are searching for, we can deliver it to you fast! Simply choose the airplane fasteners that you want and add them to your online cart and you can have them as soon as tomorrow. Our inventory is full of durable and safe commercial aerospace fasteners that can help keep your plane in optimum condition! Though small in size, aircraft fasteners can be some of the most important materials you install in your airplane. We stand behind all of the fasteners that we offer and provide products from top manufacturers such as Alcoa, Monogram, Saturn Fasteners, and many more. At Jaco Aerospace, we know that certain brands inspire trust in aircraft fasteners. Manufacturers with only the best reputations for producing high-performing aviation supplies are stocked in our warehouse. We also provide the quickest RFQ turnaround time in the industry, treating each aircraft fastener information request, large or small, with the same care, efficiency, and accuracy. If for some reason you do not see the type of fastener that you are looking for on our website, please contact one of our experienced sales representatives for more help with finding your desired aerospace fastener. Our expert staff members can help you locate the fastener that you need, whether it be for commercial or military aircraft, and we can ship it right to your hangar. For more assistance with our aircraft fasteners or any of our products for sale, call 1-888-727-5602 today!